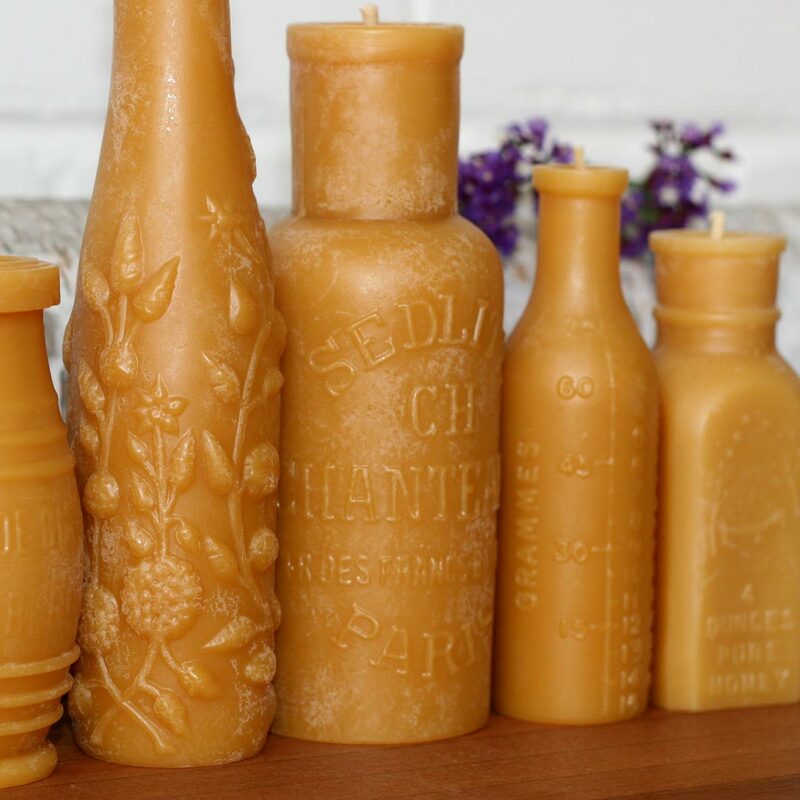 We are thrilled to stock this beautiful range of pure beeswax candles. We only have limited numbers of each bottle shape, so please refer to the list of available stock below before ordering. Pollen Arts is the story of a young couple from the US who dared to leave behind their busy city lives in search of travel, adventure, and living with a stronger connection to nature. They renovated an old 1970’s Winnebago, and spent years travelling and living in various beach towns along the coast of Southern California. 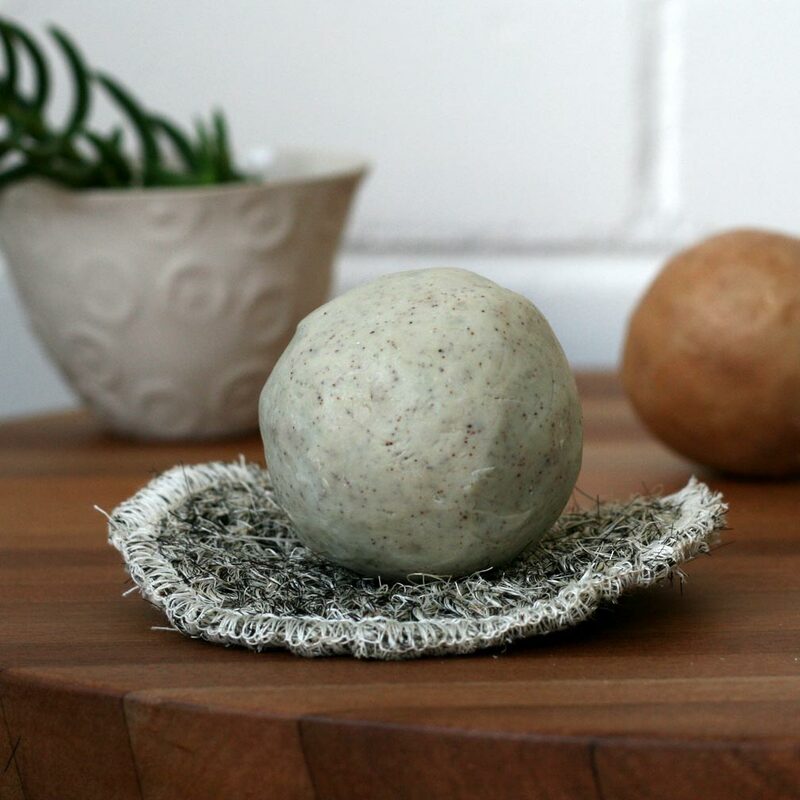 While art, writing and creativity were strong passions that threaded through their life together, candle making was never on the cards, until luck steered them in a new direction. One day, while exploring a new town they’d just moved to, they came upon a little beach cove. While sifting out sea glass and playing with hermit crabs, they found an antique bottle washed up and half buried in the sand. 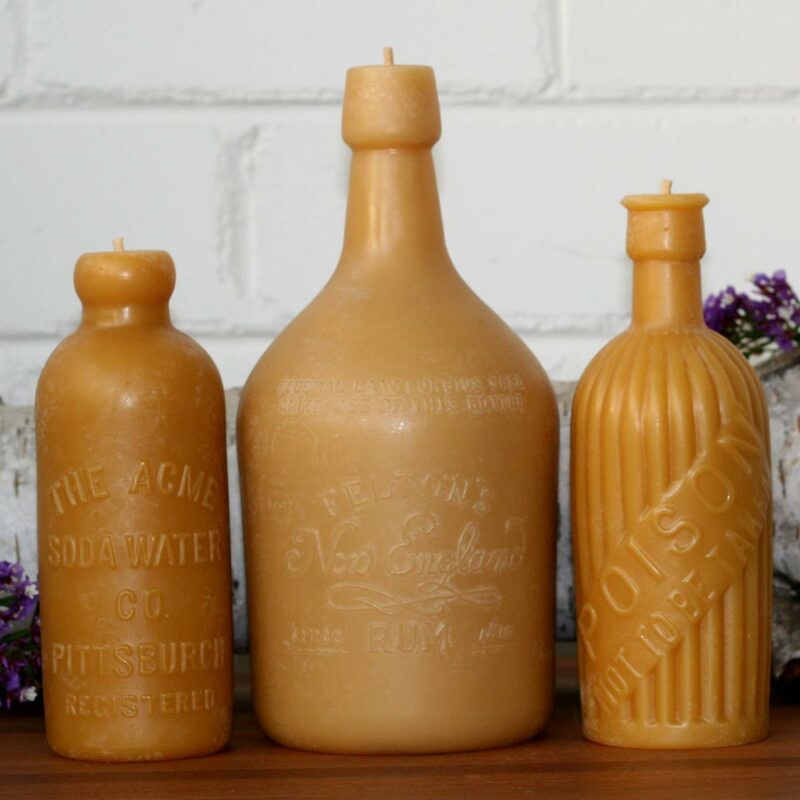 The very next day, that bottle inspired the start of their antique bottle candle range. 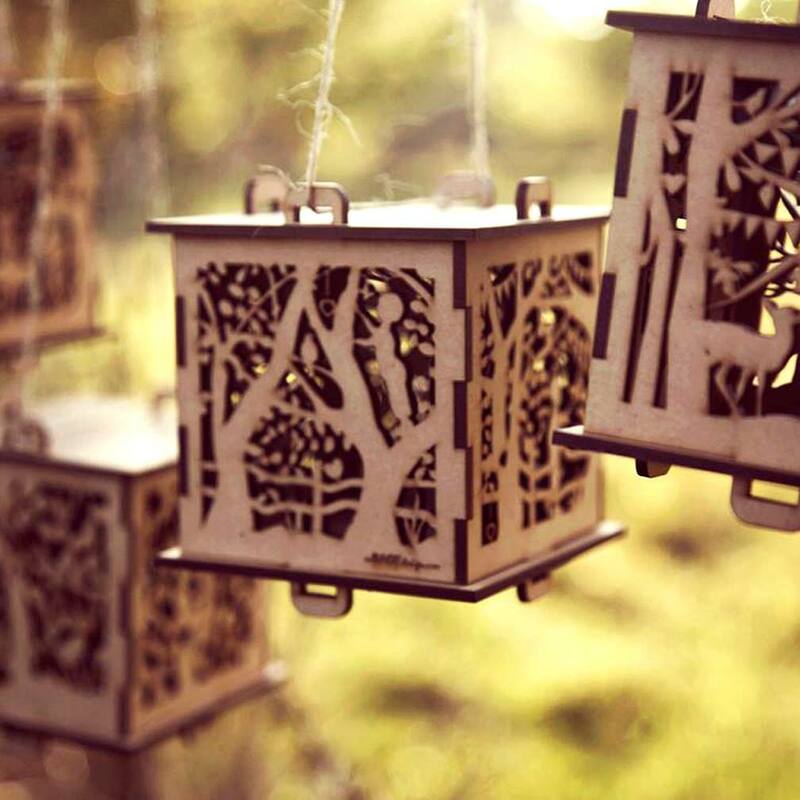 Pollen Arts grew rapidly, and thanks to Etsy, they soon found themselves as Featured Sellers, with more orders than they could manage. They soon outgrew their tiny kitchen on the Winnebago, and have now put down roots in the beautiful mountains of Arizona. 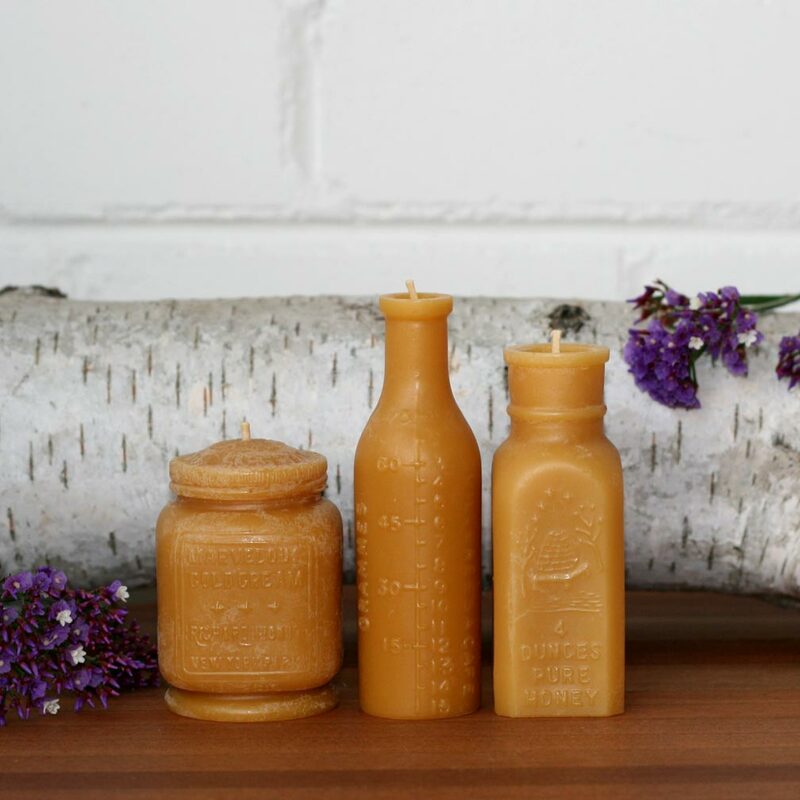 Their home now includes a candle studio, about twenty bee hives, and a growing collection of furry and feathered friends, as well as a growing family. 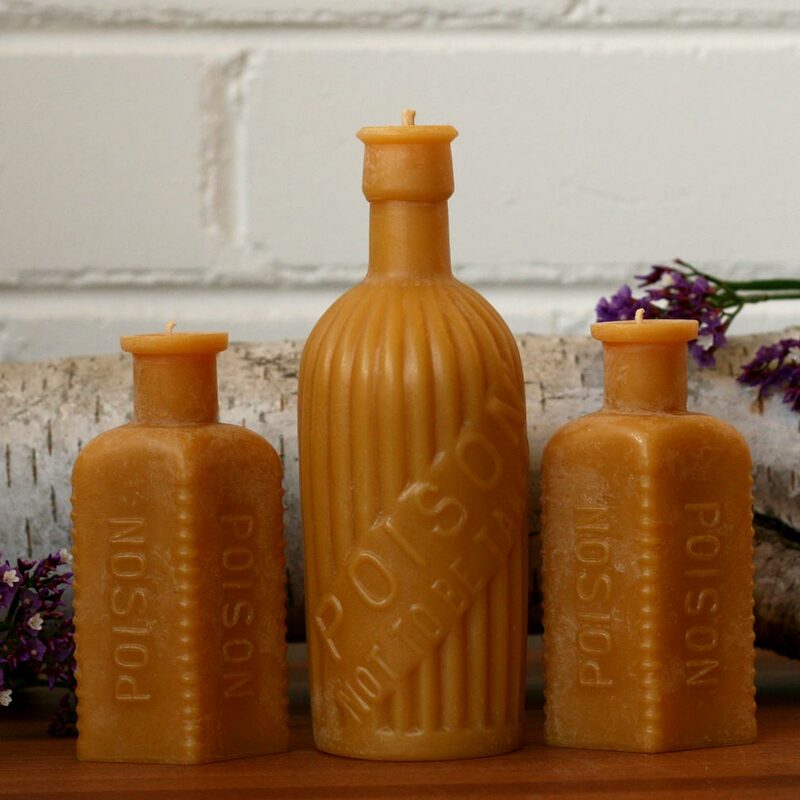 We are thrilled to stock Pollen Arts beautiful range of pure beeswax candles. We only have limited numbers of each bottle shape, so please refer to the list of available stock below before ordering. I will endeavour to keep this up to date each day to avoid any disappointment. ** Please note that as stock sells out, not all the bottles pictured will still be available for purchase. These bottles of poison were buried underground for over 100 years. The ribs on the front and sides of this bottle served as a warning for anyone who may have mistakenly grabbed them in a dark cabinet. 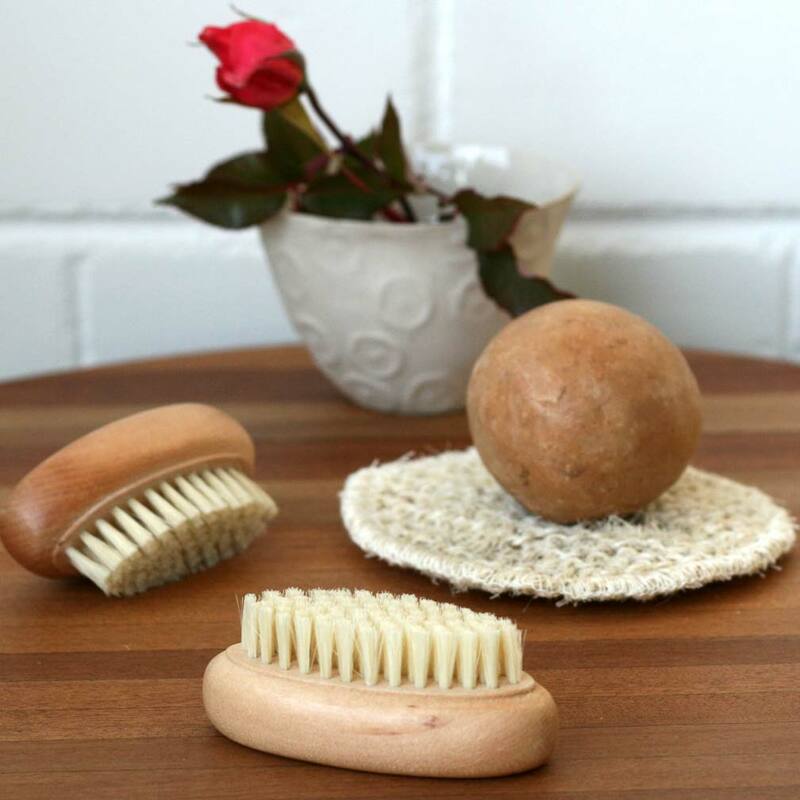 Having an oblong shape, these little bottles burn in the most interesting way – leaving behind the tall, ribbed shoulders and hollowing out through the center in a fishbone pattern. With embossed pinstripes running down from the neck, and plenty of text on the back side, this is a great looking vintage milk bottle. This bottle used to contain Lime Juice which sailors were rationed out daily by law to prevent scurvy. I imagine there are thousands of these beautiful bottles at the bottom of the sea. The heavily embossed flowers and limes look amazing as the bottle burns down and the features start to glow. History has it that the traveling priest would bring this bottle along on house calls to visit the ill and deliver last rights when needed. 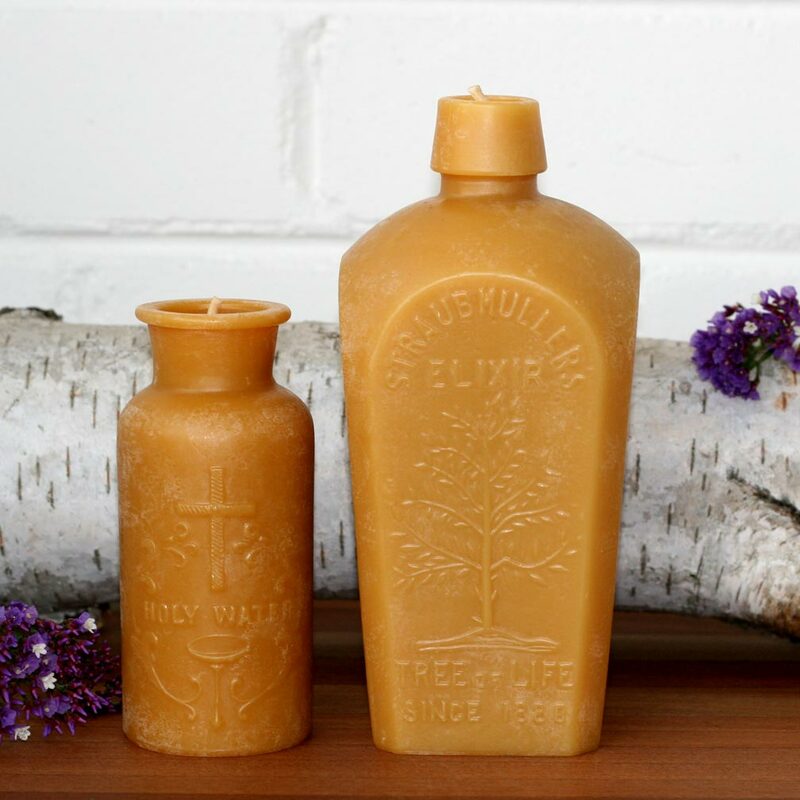 For burn-ability, we removed the glass stopper before building the mold for this candle, but it originally came with a long glass wand which held a small piece of natural sponge to sop up the holy water and cast around the room for blessings and exorcisms. A stunning and rare French bottle, the straight and narrow proportions of this bottle create the perfect burning candle. With the large embossed text, “PARIS” and, “BOURGEOIS”, this is a must for the European enthusiast or collector of fine French things. This is one of our oldest bottles, dating back to 1880. The glass on this bottle is thick and heavy. The bold embossed text stands out perfectly on the front as well as the interwoven logo on the back, “A, W, S, Co.”. The ‘blob top’ neck and lip is classic to its time period. We had to hunt all the way to the UK to find this poison bottle. Purchased directly from the urban archeologist who found it, this bottle was freshly dug up from beneath the layered earth of a century old residential dump. It’s unlike any we’ve ever seen to date. With deep grooves running down from its neck and the words “POISON. NOT TO BE TAKEN” embossed sideways across its chest, this piece feels more like an exotic snake than an antiquated household item. And besides its character and foreshadowing, this tall bold statement just so happens to be a beautiful burn. Once through the neck and shoulders, the wax melts away in staggered blades left behind by the thick ribs, and deeper still, the warning text will flicker and glow from the flame within. 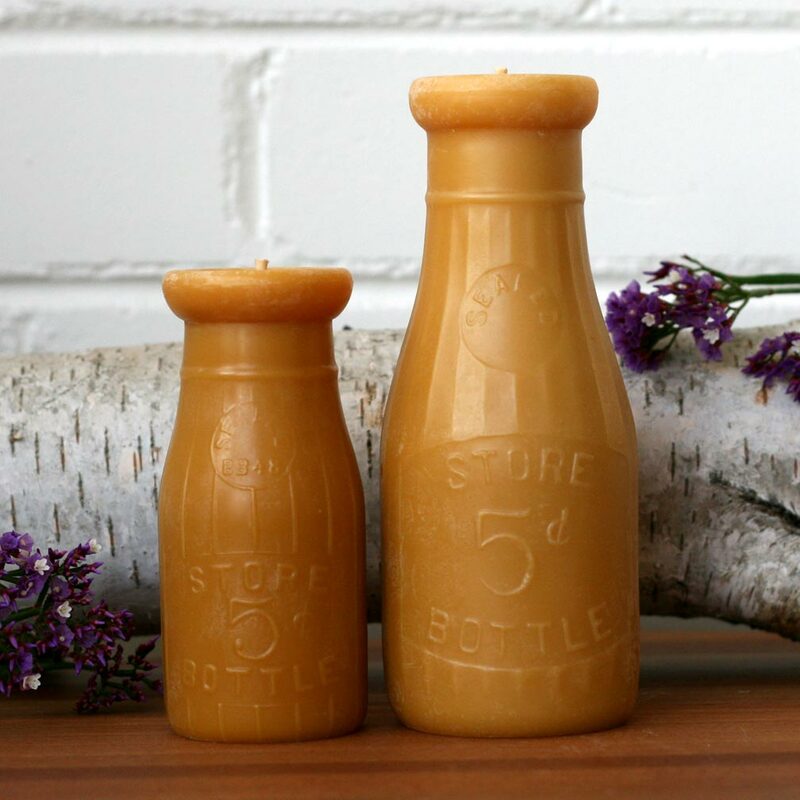 This is a classic dairy bottle with ribs running from the bottle neck all the way to the base. Covered in text, it’s a testament to it’s 1940’s time period. This is a good long burn, and will give you many nights enjoyment. Featuring “New England” in beautiful script, this is the perfect candle to sit at the edge of your bar, or center stage on your table amidst a steaming seafood dinner. Just make sure that you burn it long enough (4+ hours at a time) once you get into the shoulders of the bottle, that way you’ll thin the walls enough to get a good, golden glow coming in through the imagery. 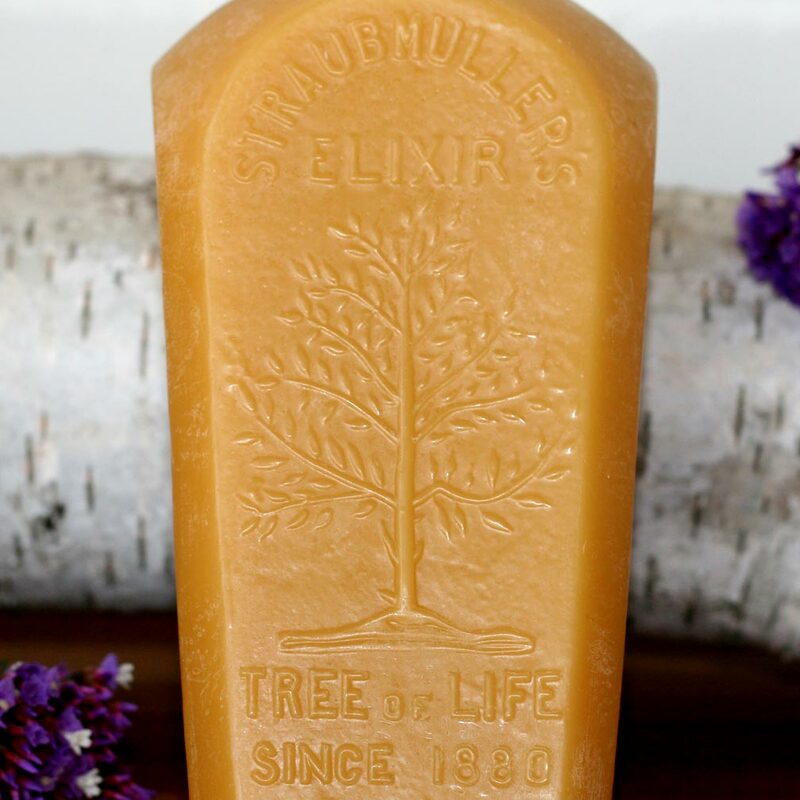 From it’s gorgeous oblong shape, to the embossed text and large Tree image, everything about this bottle is amazing. Watching the flicker of the flame glow behind the Tree is mesmerizing. The branches and leaves almost dance for you as they appear to burn. Truly resplendent!